Digital UltraViolet and Digital Copy will makes it possible for you to stream the movie The Darkest Minds HD UV or iTunes Code instantly to your computer and compatible Smartphones, Andriod, iphone, iPod Touch, iPad and tablets devices anytime, anywhere. 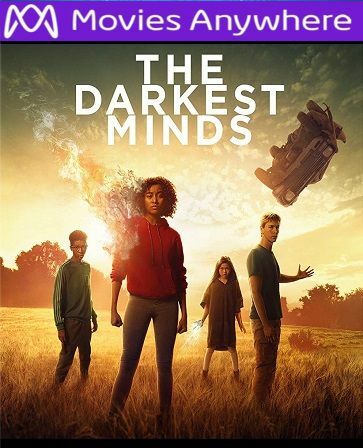 You can also download a Digital UltraViolet Copy or a Digital Copy of the movie The Darkest Minds HD UV or iTunes Code to your computer and compatible devices. Ruby Daly never thought she would survive the horrible plague that killed 98% of America's children... but she did. Those who survived the disease were left with unnatural powers that could only be described by a color: the greens (super intelligent), the blues (telekinesis), the yellows (control over electricity), the oranges (power over the mind), and the reds (control fire). Ruby is an orange, a dangerous one. She is sent to Thurmond, a camp for kids like her. She is miserable there and scared of what happened to the others like her. She hides under the facade that she is a green and watched as those like her are taken away. She escapes this horrible place with the help of the children's league, and from there her life changes forever.